To reserve your place in the program, the participant is required to first make the balance payment (full program fee less desired SkillsFuture claim amount) via bank transfer to the training provider (Mindful Moments). For example, if you would like to claim $500 from SkillsFuture, the balance payment you should transfer will be $650 (early bird rate) - $500 = $150. The MBSR teacher will issue to you an official e-invoice, which you are required to upload when claiming your SkillsFuture credits. The participant should then proceed to make the SkillsFuture Credit claim (of desired amount) at least two weeks before the start date of the program. Once the claim has been approved, Mindful Moments will receive a notification, and will then confirm your place in the program. ​​Participants who do not successfully claim the SkillsFuture credits or make their balance payment will not be able to have their place confirmed in the program. ​Step 1: Register for the MBSR program. Step 2: Receive an email from the MBSR teacher to complete a short intake form. Step 3: Arrange for a quick consultation call with the MBSR teacher to align expectations. Step 4: Make payment of the balance program fee to reserve your place in program. Step 5: Upon receiving an e-invoice from the MBSR teacher, proceed to make SkillsFuture credit claim of desired amount at least 2 weeks before program start date. ​Step 6: Upon approval of SkillsFuture claim, your place in the program will be confirmed via email. 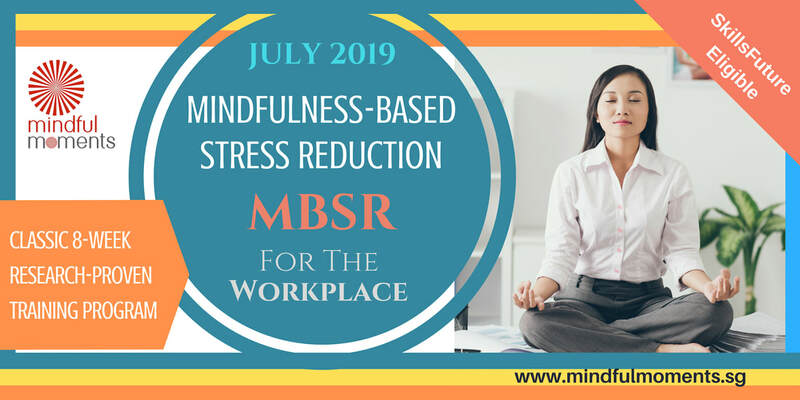 This mindfulness program introduces participants to workplace-focused mindfulness training, based on the research-based 8-week Mindfulness-Based Stress Reduction (MBSR) program. Through key mindfulness practices, group discussions and inquiry into experiences, participants will learn foundational mindfulness skills and techniques that can be easily incorporated into their unique workplace setting to improve work engagement and career sustainability. ​This program consists of eight weekly sessions (about 2.5 hours per session) as well as an all-day retreat, and is taught by an approved facilitator in a group setting. Class sizes are kept small (usually not more than 12-15) to maximize the effectiveness of facilitation and group learning. ​Mindfulness techniques taught in the program include formal and informal practices of observing our body, breath and thoughts, as well as gentle stretching movements. The learning process also includes group discussions and some didactic teaching, all of which are exceptionally important to the participant's learning in the program. Mindfulness in the program is taught in a safe environment emphasizing self-care and the cultivation of moment-to-moment awareness, a non-striving attitude, non-judgmental acceptance, as well as self-compassion. ​The program is designed to encourage active participation and commitment to practice, and so participants are required to follow up on the home practice assigned to them each week. Participants who successfully complete the program will receive a certificate of completion. The teacher is expected to guide participants' learning of mindfulness skills through the program, encourage their discovery of connectedness and resilience in the workplace, and conduct meaningful discussions and dialogues within the group to facilitate the learning process. S/he should embody the foundational attitudes of mindfulness and be able to take care of the group's safety as well as address boundaries of trust and confidentiality. It is important to note that the MBSR teacher should not assume the role of a therapist or counsellor in the program. 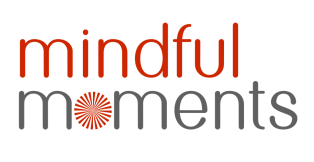 ​The program will be taught by Erin Lee, Founder and Mindfulness Coach of Mindful Moments Singapore. She is a Certified MBSR Teacher as acknowledged by the Mindfulness-Based Professional Training Institute (MBPTI) of the University of California San Diego (UCSD) Center for Mindfulness to conduct and deliver the classic Mindfulness-Based Stress Reduction (MBSR) Program. Erin completed the UCSD School of Medicine's Mindfulness-Based Stress Reduction Teacher Training Intensive as well as Advanced Teacher Training Intensive for MBSR and MBCT Teachers in California. Erin is trained to teach the .b mindfulness program to teenagers and young adults as recognized by the Mindfulness in Schools Project. Erin conducts mindfulness training for corporate clients and organizations, and is also an experienced polytechnic lecturer.